﻿International Day of happiness: Calendar, History, Tweets, Facts, Quotes & Activities. The International Day of Happiness seeks to celebrate and promote world happiness as a fundamental human goal. It recognizes the need for a more inclusive, equitable and balanced approach to economic growth, one that promotes sustainable development, poverty eradication, happiness and well-being of all people. 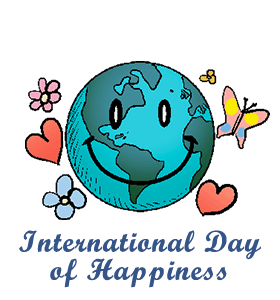 At the UN Conference on Happiness in 2012, the United Nations proclaimed the International Day of Happiness. The day was celebrated for the first time on March 20, 2013 in an effort to highlight the importance of global happiness and its impact on world development and peace. The theme for International Day of Happiness 2019 was "Share Happiness". Finland was the happiest country in the world according to the 2018 World Happiness Report. The United States was at the 18th place. The happiest city in the U.S. was Fremont, CA, according to a 2018 study by WalletHub. In 2016, Red from the Angry Birds was appointed as Honorary Ambassador for International Day of Happiness in order to further promote the year's theme of addressing climate change. There are currently about 1.8 billion young people in the world, more than ever before, creating an unprecedented opportunity for economic and social progress. Many studies have proved the link between happiness and productivity. Print out and hang up posters of the Ten Keys to Happier Living. Research has proven that these ten keys have a positive impact on happiness and well-being. Make the effort to cross an item off of your bucket list. We all have dreams and goals and fulfilling them creates happiness and a sense of accomplishment. Give to others. Whether it's donating to a charity of your choice, volunteering or giving a thoughtful gift, studies have found that giving makes us happier. Watch a movie about happiness. Our suggestions: Hector and the Search for Happiness (2014), Eat, Pray, Love (2009), The Pursuit of Happiness (2008), Bruce Almighty (2003), Click (2006) and The Bucket List (2007).